“I’m a little sheepish about sharing this one, but I promised myself that I would share all my best tips and secrets in this book, so here goes! 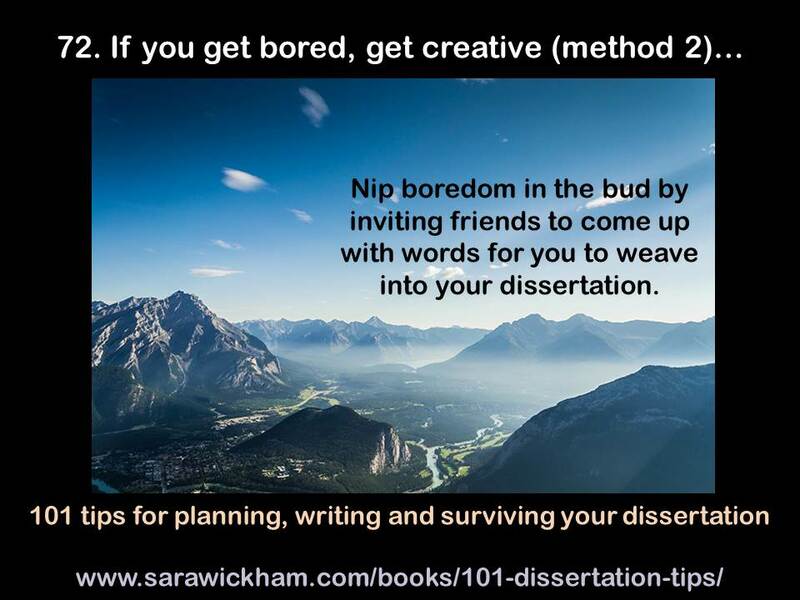 Since I was an undergraduate student (when a housemate and I came up with this idea, although I’m sure many other people have thought of it too) I have nipped boredom in the bud by occasionally inviting friends and family to come up with a handful of words that I need to insert somewhere into my essay or dissertation. About five words is a good number for me, and it helps to tell your friends at the outset that, while the idea is to challenge you to find a way to get in words that you might not normally use, you can’t realistically insert colloquial or very technical terms or swear words into most dissertations*. If you try this and get them all in, please share your achievement with the world in the comments below! You can read lots more about the book on this page, and it’s available from Amazon UK, Amazon.com, Amazon France, Germany, Canada, India, Italy, Mexico, Spain and the Kindle store. ← I have book, twitter and party news to share! I found a tentative reference by a K Bolloc, I was determined to get it in, I also manages to get colloquial ‘piss’ in!